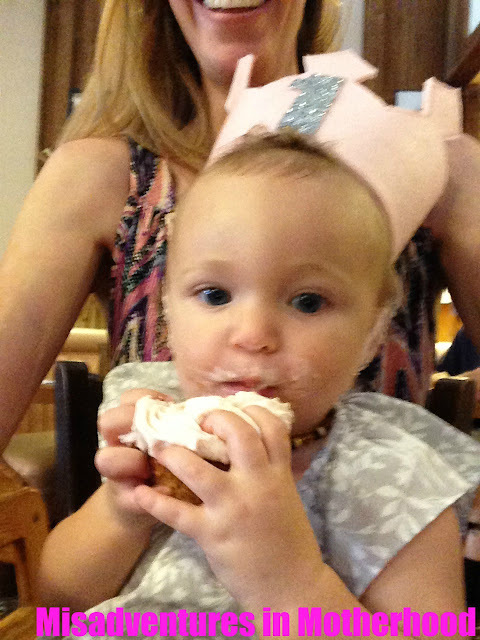 I have a confession to make: I totally phoned it in with regards to celebrating the Little Lady's first birthday. I had every intention of doing it right: I set up Pinterest boards, and had grand ideas about hosting a Martha Stewart-worthy backyard shindig but I just ran...out...of...steam. I've been using the fact that our back deck is under construction as a (very good) excuse for not having a party, but that's only half true. The real reason I didn't go all out for Rose's birthday is that having two kids 18 months apart, a job, and very little childcare doesn't leave me with a whole lot of extra time to craft crepe paper roses and bake flower-shaped birthday cakes. Besides, it's not like Rose is going to remember her birthday, so it doesn't really make sense to spend a ton of money on a bounce house and party favors when those shekels could be much better spent on wine. Er, I mean, saving for a house. I tell people all the time that one of the greatest gifts of parenthood has been learning that "good enough" is enough. In the spirit of my new motto, I decided to put together a party that was not over the top and not glamorous, but definitely good enough. Who needs bagels when party hats taste so delicious? 1. Only invite immediate family. I can see that this might not be an option if you're an only child married to an only child with parents who live half way across the country, but "immediate family" in our case equals 18 people. If we didn't have such a big family I probably would've invited a few of Rose's little friends, but 20 guests was the most I could handle without having an anxiety attach and having to call my therapist for an emergency phone session. I roped my Mom into making her crown - she's a lot cheaper than Etsy! 2. Do it at a restaurant. You know what's amazing about restaurants? They cook all the food, they serve all the food, and they do all the dishes. It's wonderful. We decided to do brunch at Canter's, because everyone loves deli food (especially a big bunch of Jews), it's reasonably priced, and we knew they would be able to accommodate our party. Everyone was happy, even my Brother-in-Law who is a vegan, and at the end of our brunch we packed up our gifts, grabbed a pint of whitefish salad to take home, and hit the road. In my opinion party hats are always worth having - even for the most low key shindig. 3. Good cupcakes make or break a party. I was going to attempt to make cupcakes that looked like roses, but then I realized that I was completely delusional and there was no way in Hell I would have time to bake, let alone learn how to pipe flowers out of frosting. Once I got my wits about me, I remembered that my Lifestyle Editor, Allyson, is a professional baker and that I would be completely insane not to utilize her exceptional talents for Rose's cupcakes. They were delicious and beautiful and everyone scarfed them down - especially the guest of honor. 4. Party favors are optional. Let's be honest, most of the time the party favors your kids bring home end up in the recycling bin. If you're going to do favors, do something unique and that's not just more crap. I found some beautifully packaged Japanese rose candies that doubled as table decor, and were unique and interesting enough that everyone wanted to try them. Double win: the Canter's staff threw away the empty packages after my nephews ate them all! Chris is thrilled the party didn't cost much, and I'm happy I didn't have to clean up! 5. Don't feel like you let your kid down. Look, there's always going to be somebody who gives you sh*t for not throwing an over-the-top birthday party. If people want to go all out, I say more power to them! But let's all just agree that a one year old doesn't know the difference between having a Costco cupcake at home or a destination birthday party catered by Mario Batali. The Universal truth is that no matter how much (or how little money) you spend, your kid is probably going to end up crying before the party is over.